My buddy Lin had another awesome blogger swap. We were paired up with partners and then we had to spend at least $20 on goodies so that they could have the "Perfect Night In". I Love Everything!! I am trying the mask today since it is my first day off since I got my package. The nail polish and gum are SO "Me". Cherry Blossom is my favorite scent and I stashed my hand cream at work since I needed some for my desk. $10 Target gift card = awesome. Thanks Kari for being such an awesome swap partner and I hope we stay in touch. If you are a blogger interested in signing up for swaps, keep an eye on Lin's website. She hosts them quite often. 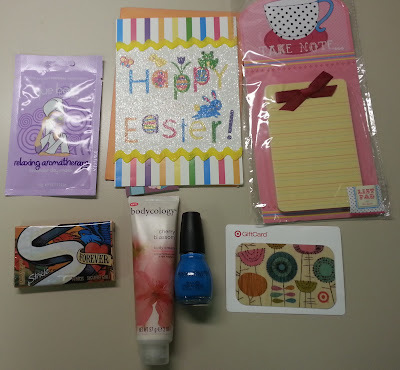 If you are a reader wanting to swap, leave me a comment. I would be willing to set something up if enough people are interested. Yea! I'm so glad you liked everything! We will for sure stay in touch :) Oh and if you ever need a co-host for a swap, I'd totally be interested! Everything looks so pretty. I love doing swaps. I crochet and once a year I participate in a potholder swap. It's lots of fun and I get other pretty potholders. You made her such a cute set! It looks like so much fun!